Sugalight is an innovative healthy ice cream that addresses the modern day need for healthier snacks and diets. Sugalight is entirely developed and manufactured in Singapore. The ice cream is awarded the HPB ‘Healthier Snack’ logo. 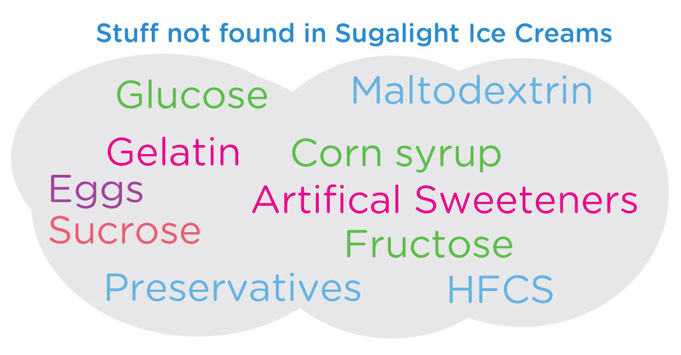 Sugalight ice creams are as delicious without the use of sugars (sucrose, glucose, fructose). Natural sugar replacements (Xylitol and Maltitol) with much lower glycemic index (GI) are used instead. Xylitol and Maltitol are natural sweeteners that are HPB-approved sweeteners and do not contribute to tooth decay. Sugalight products follow the Health Promotion Board’s guidelines for Healthier Snack. Our ice creams and cakes DO NOT contain artificial sweeteners. These include aspartame (Equal), sucralose (Splenda), acesulfame K, saccharine and many others. Sugalight ice creams are high in prebiotic soluble fibres which help the growth of beneficial gut bacteria. Many premium ice cream brands found in supermarkets tend to have high butterfat content of 16-18%. The high fat content can result in weight gain and cardiovascular diseases. Sugalight ice creams cut this fat level to 8% while still maintaining the creaminess you desire.